9.1 3D Laser Mapping Ltd.
Once a niche market, the airborne LiDAR technology has now become a novel solution for geospatial data acquisition. The basis of this development is the ability of airborne LiDAR system to measure directly the 3D structures using active sensors. Studies have shown that airborne LiDAR system can provide high-resolution geospatial data for multi-resource management. The data acquired through airborne LiDAR system is reliable and accurate, thus, can be utilized for the development of national guidelines and standards in different domains. In combination with simultaneously acquiring aerial imagery and data points, airborne LiDAR system is an extremely prevailing system which supports wide range of applications. However, there are several market factors that will define the dynamics of the airborne LiDAR system industry in the next five years. Velodyne LiDAR, Inc., RIEGL Laser Measurement Systems GmbH, YellowScan SAS, Trimble Inc., Leica Geosystems AG, Phoenix LiDAR Systems LLC, and LeddarTech Inc. are some of the major players of the global airborne LiDAR system market. High demand for airborne imaging systems worldwide, superiority of LiDARs as compared to conventional sensors, and rise in the demand for miniaturized Micro-Elector Mechanical Systems (MEMS) sensors are driving the growth of the market. Moreover, high price of LiDARs and complex design and development of LiDARs act as the major challenges to the growth of the market. Furthermore, utilization of LiDARs for rail data capture, emerging applications of LiDAR sensor, and innovations in LiDAR technology are expected to create lucrative opportunities for the market in the coming years. Each of these factors has a definite impact on the growth of the market. The airborne LiDAR system market reported a revenue of $732.4 million in 2016, and the UAV platform is expected to generate the highest revenue by 2021. The preceding figure shows the market analysis by different platforms. 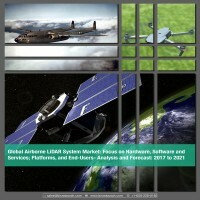 UAV platform had the highest market penetration rate in the overall airborne LiDAR system market in 2016, followed by aircraft and satellite, mainly due to the maximum number of airborne LiDAR systems being deployed in drones for commercial end-user, along with the increased number of emerging start-ups in the UAV market. Companies operating in the market are specifically designing airborne LiDAR systems for small drones, which are light weight and cost-efficient. There is an increase in the number of manufacturers in the market, mainly due to reliable, precise, and outstanding outputs of airborne LiDAR system equipped UAV aerial mapping systems. The demand for airborne LiDAR system across different geographies soon is expected to be promising, with North America having the highest market share during the period 2016-2021, followed by Asia-Pacific, Europe, and Rest of the World. North America is expected to maintain its dominance through the forecast period, with the maximum number of airborne LiDAR systems deployed in drones for commercial end-user in the region. Furthermore, the emerging start-ups in the region are also keen on developing airborne LiDAR system for the emerging applications for varied end users, thus, boosting the utilization of airborne LiDAR system for commercial usage. Europe is expected to witness the highest growth rate in the market, mainly driven by heavy investment by the leading players in the market, including RIEGL Laser Measurement Systems GmbH, SABRE Advanced 3D Surveying Systems Ltd., and Leica Geosystems AG in developing enhanced and cost-effective airborne LiDAR systems for UAVs.